Back in March, we reported that there were more than 10,000 Alexa skills available to owners of an Echo or Echo Dot device (Echo Show was not available back then). Recent estimates by Voicebot, also confirmed by Amazon, show that Alexa can now ‘learn’ more than 15,000 skills that are available in the US, thanks to a very engaged skill developers community. 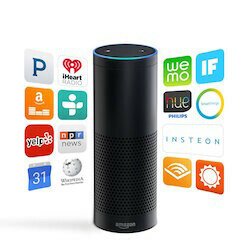 Amazon’s voice assistant has taken the smart home arena by storm, having launched in late 2014. Alexa’s skills are small, app-like pieces of software that are capable of carrying out specific functions upon command – ‘Alexa, what’s the weather in Chicago,’ for example. The 15,000 figure was actually reached for the first time on the last day of June, after a very up-beat month for developers. Apparently, the growth rate of the skills pool spiked to 23% in that month, more than doubling growth in the previous three months. Voicebot reported that Flash Briefings, quite a simple kind of skill, are currently the most popular of skill categories, accounting for up to 20% of all available Alexa skills. Back in May, Amazon started rewarding developers of quality code with cash, in a bid to build on the quality and diversity of available skills. Amazon’s AI currently leads on competitors’ app counts by ridiculous margins. Google Assistant, for example, can interact with 378 apps, which is not that impressive, given it launched more than a year ago, if we are to judge by Alexa’s expansion rates. Microsoft’s Cortana lags miles back, with only 65 supported voice apps. Alexa doesn’t really have much competition in the smart home department, which has helped Amazon position itself as a leader in the field. The company could be expected to conquer up to 70% of the market of voice-powered devices by the end of 2017. However, Apple’s recently announced Siri-enabled speaker, the HomePod, will most certainly cause a splash in Amazon’s pond. How big the splash will be – we can’t really know just yet. In this regard, an Amazon executive recently said he was hopeful that Siri and Alexa will be able to communicate with one another. Cupertino has not confirmed anything of the kind, meaning both AI assistants could still be in competition, rather than in completion with each other. Nonetheless, we would expect that Amazon and skill developers from around the globe will only push themselves harder and further, in the months and weeks before the HomePod’s entry. Even though we expect Apple to offer something quite attractive this fall, Alexa’s head start in the area does begin to look very comfortable. Siri has one skill.. "Here's what I found on the web..."
What if siri respond like this.... "Here's what I found on the Google"
What has siri got to do with this? Lmao! U feeling inferior already? He's still butthurt about the failure that is Bixby, hence his deflection. If you or Bankz cared to read this article. Then Siri and Apple's HomePod were both mentioned​. Plus if all you ever used was iPhone's, then you certainly wouldn't know that there is much better Assistants​ on the market than Siri. It's not a matter of being butthurt. It's about the Truth. Siri is the worst AI Assistant on the market. Hands down. I agree. Siri doesnt deserve to be mentioned in the same breath as any of the other AI platforms. She's that bad at this point. This is the Main problem with the Amazon Echo "Skills" you have to remember what the skills are called to get the info, why not add loads of categorys in the app to assign skills. IE, Sports, Transport, Tech news. As you should already know, quality is better than quantity and the Google home API has only been on the radar since January. Amazon is completely in the lead with Alexa at home: the question now is can they extend that somehow into the mobile arena, the work environment and personal transport?